The Maharashtra Government will soon give a reorganization of 'children with special needs' to the children in the red light areas. Mr. Subhash Zanak, Cabinet Minister of the Department of Women Child Development of Maharashtra state has assured Snehalaya family to correct the category in this regard. This decision will encourage the N.G.O’s start the shelter homes specially for the children of prostitutes. His department immediately issues a license and funding to the institutions if they shelter the children of special needs. Mr. Zanak, accompanied by all top officers in his department visited each of Snehalaya’s projects and discussed issues with volunteers. He appreciated Snehalaya for having drawn his attention towards many burning issues regarding the child rights and protection. Freedom Fighter Mr. Ramchandra Patwardhan went to jail along with Mr. Vijayendra Kabra during their freedom struggle. Mr Patwardhan was imprisoned by British Govt. in 1942. He is now 85 Yrs. old but has all the enthusiasm of his fiery youth. Mr. Patwardhan was present for the flag hosting programme at Snehalaya. In the evening a common birthday of Snehalaya children was celebrated. Many eminent personalities were present for the programme. They wished good health and long lives for the our children. 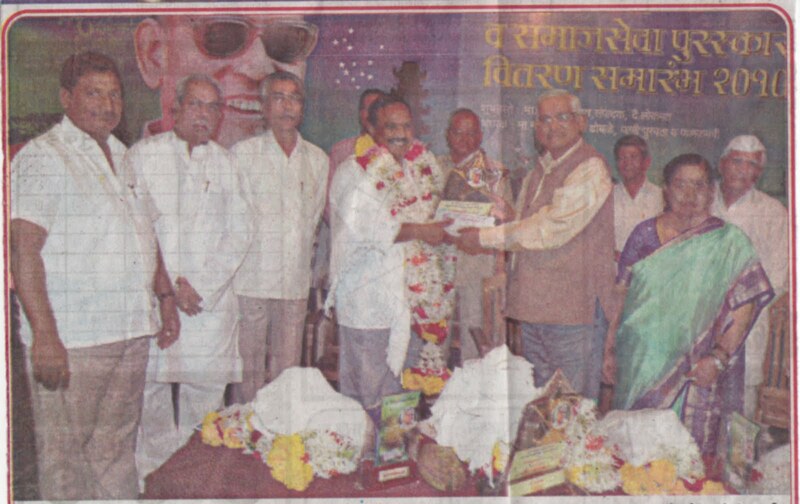 Dr.Girish Kulkarni, Founder of Snehalaya was felicitated as 'the Social Worker of the year award on Wednesday 28 July 2010 by Dr. Nirmalkumar Fadulke Foundation, Solapur. This is the 4th year of award. Dr.Girish Kulkarni is a professor of political science, by profession. He also works as a guide on various government committees. He started his work for deprived women and children at a young age of 19 years. Dr Girish Kulkarni's organization - Snehalaya has changed the lives of thousands of destitute women, children, H.I.V patients. His lifetime work and long struggle of 25 years was recognized by the foundation. The award included a Rs. 25,000 in cash. Central Power Minister Mr.Sushil Kumar Shinde, State Cabinet Minister Mr.Laxmanrao Dhoble, Editor Senior Journalist of Lokmat Mr.Anant Dixit, Mr Nirupankar Mr.Daka Thavre, Mr.Vishnupant Kothe were present as guests for the award distribution ceremony.